Torin 2 is a potent and selective mTOR inhibitor with IC50 of 0.25 nM in p53−/− MEFs cell line; 800-fold greater selectivity for mTOR than PI3K and improved pharmacokinetic properties. Inhibition of ATM/ATR/DNA-PK with EC50 of 28 nM/35 nM/118 nM,in PC3 cell lines respectively. Immunofluorescent imaging of HAECs using VE-CAD (red) and p120 (green) antibodies was performed 12 h after DMSO (control), Torin-2 (100 nM), or EVL (500 nM) treatments. White arrows denote interendothelial gaps. White bar indicates 50 μm. EVL treatment increased VE-CAD mobilization from the membrane into the cytosol (relative to DMSO) with evidence of intracellular deposits and interendothelial gaps, whereas in DMSO-treated cells, there was colocalization of p120 and VE-CAD (yellow border) with no evidence of gap formation. In Torin-2-treated cells, there was evidence of colocalization of p120 and VE-CAD at cell borders with minimal interendothelial gap formation. Arterioscler Thromb Vasc Biol, 2018, doi:10.1161/ATVBAHA.118.311321. Torin 2 purchased from Selleck. A. Western Blot analysis in the ALL-SIL cell line treated with single administration of Imatinib, Nilotinib, GZD824, Torin-2 and BGT226 for 24 h. An increase of expression of fast-migrating (lipidated) LC3A/B after drug treatments is shown. Twenty-five μg of protein were blotted on each lane. β-Actin documented equal lane loading. B. Flow cytometric analysis of autophagy in the ALL-SIL and PEER cell lines treated with single or combined administration of Imatinib, Nilotinib, GZD824 with Torin-2 or BGT226 for 24 h. CTRL, control (untreated) cells. Asterisks indicate significant differences in comparison to single drug treated samples (*p< 0.05). Imatinib, Nilotinib, GZD824, Torin-2 and BGT226 were abbreviated in IMA, NIL, GZD, TOR and BGT. Oncotarget, 2016, 7(48):79842-79853. Torin 2 purchased from Selleck. U2OS cells were plated in six-well plates using complete medium. The next day the cells were washed four times with NaCl/Pi before maintaining them for 6 h in serum- and glucose-free DMEM supplemented as indicated in the absence or presence of 0.1 uM Torin 2 for the last 1 h. The cells were control- treated, treated with 1 ug/mL insulin or treated with 1 mM H2O2 for 15 min. Thereafter, cell lysates were prepared and western blotting was performed using the indicated antibodies. FEBS J 2014 281(16), 3591-608. Torin 2 purchased from Selleck. Bone marrow derived macrophages were pre-treated with 10nM Torin for 1h prior to LPS treatment (100 ng/ml). TNF-a production was analyzed 24h later. Torin 2 purchased from Selleck. Cellular IC50 values for mTOR are determined using p53−/− MEFs. Cells are treated with vehicle or increasing concentrations of Torin 2 for 1 h and then lyse. Phosphorylation of S6K1 Thr-389 is monitored by immunoblotting using a phospho-specific antibody. Meanwhile, cellular IC50 values for PI3Ka are determined based on phosphorylation of Akt Thr-308 in p53−/−/mLST8−/− MEFs or human PC3 cells expressing the S473D mutant of Akt1. Method: For viability, MZ-CRC-1 and TT cells are seeded in quadruplicate in 96-well plates (1.0×104 cells per well) in culture media with 2.5% and 4% FBS, respectively. After 24 hours, cells are treated with Torin 2. At the indicated time point, cells are incubated for 3 hours with 10 μL of CellTiter96 AQueous One solution in 100 μL of culture media and absorbance is measured at 490 nm. Liu Q, et al. J Med Chem, 2011, 54(5), 1473-1480. Settembre C, et al. EMBO J, 2012, 31(5), 1095-1108. Tamburrino A, et al. Clin Cancer Res, 2012, 18(13), 3532-3540. Berry T, et al. Cancer Cell, 2012, 22(1), 117-130. Liu Q, et al. Cancer Res, 2013, 73(8), 2574-2586. Rapamycin (Sirolimus) : mTORC1-selective, IC50=~0.1 nM. Rapamycin (Sirolimus) : mTOR, IC50=~0.1 nM. Temsirolimus (CCI-779, NSC 683864) : Approved by FDA for Renal Cell Carcinoma (RCC). XL388 New : Highly potent, selective, ATP-competitive inhibitor of mTOR with IC50 of 9.9 nM, 1000-fold selectivity over the closely related PI3K kinases. MHY1485 is a potent, and cell-permeable mTOR activator, and also potently inhibits autophagy. CHIR-99021 (CT99021) is a GSK-3α and GSK-3β inhibitor with IC50 of 10 nM and 6.7 nM, respectively. CHIR99201 does not exhibit cross-reactivity against cyclin-dependent kinases (CDKs) and shows a 350-fold selectivity toward GSK-3β compared to CDKs. Dorsomorphin is a potent, reversible, selective AMPK inhibitor with Ki of 109 nM in cell-free assays, exhibiting no significant inhibition of several structurally related kinases including ZAPK, SYK, PKCθ, PKA, and JAK3. Also inhibits type I BMP receptor activity. 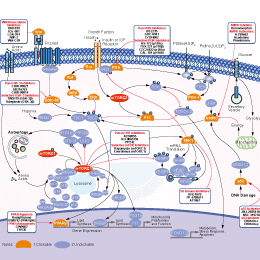 Rapamycin (Sirolimus) is a specific mTOR inhibitor with IC50 of ~0.1 nM HEK293 cells. Everolimus (RAD001) is an mTOR inhibitor of FKBP12 with IC50 of 1.6-2.4 nM in a cell-free assay. AZD8055 is a novel ATP-competitive mTOR inhibitor with IC50 of 0.8 nM in MDA-MB-468 cells with excellent selectivity (∼1,000-fold) against PI3K isoforms and ATM/DNA-PK. Phase 1. Features:First drug to inhibit both types of mTOR protein. Torin 1 is a potent inhibitor of mTORC1/2 with IC50 of 2 nM/10 nM in cell-free assays; exhibits 1000-fold selectivity for mTOR than PI3K. Temsirolimus (CCI-779, NSC 683864) is a specific mTOR inhibitor with IC50 of 1.76 μM in a cell-free assay. 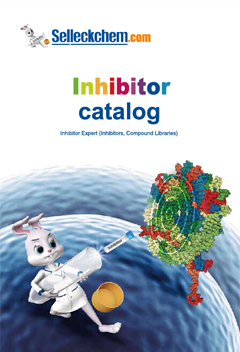 Sapanisertib (INK 128, MLN0128) is a potent and selective mTOR inhibitor with IC50 of 1 nM in cell-free assays; >200-fold less potent to class I PI3K isoforms, superior in blocking mTORC1/2 and sensitive to pro-invasion genes (vs Rapamycin). Phase 1. Tacrolimus (FK506) is a 23-membered macrolide lactone, it reduces peptidyl-prolyl isomerase activity in T cells by binding to the immunophilin FKBP12 (FK506 binding protein) creating a new complex.